Are you looking to sell your car for cash in Christchurch? Get Instant Cash for Your Car up to $12000. Cash for Your Car on the Spot. Start the effortless process today with us and wait no longer! We will collect the vehicle and pay cash on the spot. Simply provide us with some details and you’ll receive a 100% GUARANTEED quote and make arrangements for the vehicle to be picked up at YOUR convenience. Upon pick up, you will be paid Cash for Your Car. Our tow truck driver will leave and you’ll be left with CASH and a smile, even on the same day! We are top local cash buyer for your vehicles. We are RELIABLE and provide quick and efficient service to all of our customers. With over decade in this industry, we are KNOWLEDGABLE and know how to suit your needs best. We PAY TOP DOLLAR for your unwanted vehicles and we pay GUARANTEED TOP CASH. We pay at the time of pick up. Our PROFESSIONAL staff will make you feel good about getting rid of that old car, 4wd, vans, or trucks. We Pay CASH ON THE SPOT! Our same day service could make this the best day ever! Why wait!? We readily accept any model, any condition. This means whether you have a scrap car, damaged 4wd, wrecked van, used truck, accidental commercial vehicle etc. 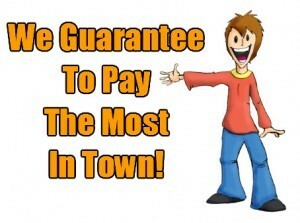 We will quickly perform free pick up that pay cash in your hands.